Last weekend I was invited to try out the Huxley's brunch menu and to say I was excited was an understatement. If you've read even one of my blog posts you've probably gathered that I am a die hard fan of a weekend brunch. I honestly can't remember a weekend where I didn't go for brunch. Breakfast food is the best because it's not only acceptable to have something sweet it is equally acceptable to have something savoury and even better is when you combine the two. Brunch is just a longer period of time where it is acceptable to eat breakfast foods and that is why I love it. Right I've got to break the bad news to you first before I get to the good stuff. The menu I'm about to talk about is only available Sunday 12 noon – 5 pm. I know, I'm sad about it too. But if you're not out for brunch on a Sunday then you have serious issues anyway (or I'm starting to think I do given my unhealthy obsession with brunch). When we arrived we were seated at this little corner of the building on the right-hand side when you come in. This is definitely where you want to sit if you're ever in the Huxley as it is the prime spot for views over the castle. We were there on a pretty nice day and the big windows really lit up the room. It was also the prime location for watching the tourists take pictures with the cow that sits outside the Huxley (not a real cow, a statue of a cow). We were especially amused when a couple of ladies got down on the ground and posed for a picture as if they were drinking milk straight from its udders! The staff don't seem to mind too much if people jump on for a photo op as long as they don't try and push the thing over. I'm not going to lie, I have vague memories of attempting to jump on that cow myself on a few very drunken occasions (sorry miss Huxley cow). In all seriousness, definitely asked to be seated at the windows if possible, it's great for people watching and fantastic views up to the castle. 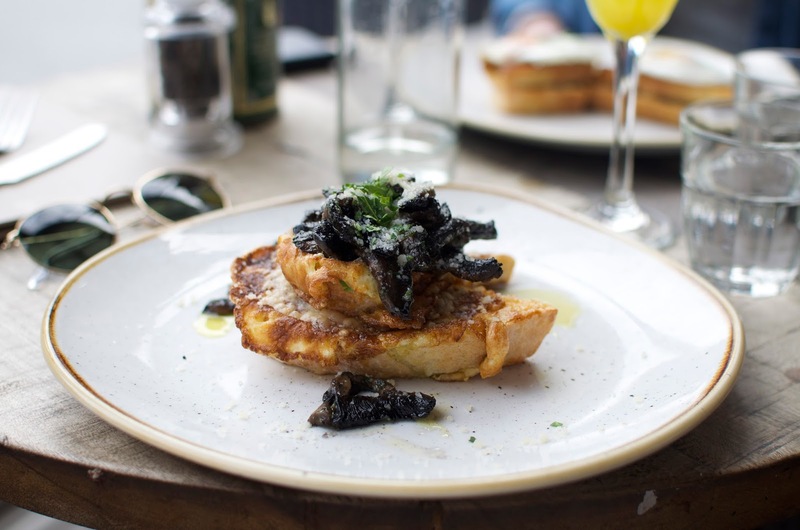 The Sunday Brunch menu has a pretty diverse range of food from your breakfast-type foods such as avocado toast and fry-ups to your classic British Sunday lunch meals such as fish and chips or a burger. This means there's something for everyone, even if you're not a fan of breakfast (but in that case you wouldn't be my friend). There's a pretty diverse range of meals and even a couple salads (you know I barely even glanced at those though) although I will say there are only a handful of options on this menu for vegetarians. I brought my sister along for brunch and she ordered the 'Roast Beef Croque Monsieur', a twist on the classic French toasted sandwich in its use of beef and smoked applewood cheddar. She really enjoyed it and it wasn't too large a portion (ordinarily Croque Monsieurs tend to be absolutely ginormous by sandwich standards). It got the L'Appetite Foodie's sister's seal of approval! I went for the 'Parmesan French Toast' which, spoiler alert, was so good, I'm already dying to go back for it. I don't often get to order French toast in restaurants because they usually use cinnamon in the egg mix (and I'm bizzarly allergic to cinnamon) as it tends to be a sweet meal, so I was really excited to see a good take on a savoury French toast. The fluffy and super cheesy parmesan French toast was topped with fried portobello mushrooms and garlic oil which went really well. If you're a fan of cheese and mushrooms like me then you'll love this. We didn't feel too overly full so we decided to have a glance at the dessert menu. The menu is just three items but at only £4.50 they're pretty affordable puddings. Upon our waiter's recommendation we went for the 'Sweet Potato Pie'. Now I didn't really know what to expect with this, but I'm an adventurous eater and love trying new things. The pie was a weird (but not bad weird, good weird) combination of sweet and savoury. The sweet potato pie was super creamy and the accompanied mild coconut ice cream really complimented it. I wasn't too keen on the pineapple and ginger compote that came with it as I couldn't stop thinking that it tasted like curry. Since the pie was not overly sweet I thought the pineapple and ginger compote would have complimented the pie better if it had been sweeter and fruitier. Instead the curry-type spices on the pineapple felt a bit out of place to me. But the pie itself was really delicious and exceeded my expectations – I'm definitely a new fan of sweet potato pies. Overall I'd really recommend the Huxley to anyone looking for a spot of brunch, especially if you want to please a lot of people. Whenever me and my family go out somewhere for brunch there's always an argument between those that want the pancakes and bacon type brunch and those that want a big old burger, so the Huxley's menu would easily settle those disputes. I'd recommend you top your meal off with a couple of Mimosas because what's Funday without a couple drinks (especially if you're hanging – Mimosas are my favourite hair of the dog). Even if Mimosas aren't your thing they've got a pretty extensive cocktail menu aside from the classic brunch drinks (Mimosas, Bloody Mary and Espresso Martini). If you don't fancy boozing at all with your brunch the menu has a few smoothie and milkshake options that look great. The Huxley sits in a prime location at the end of Princes Street at the West End (you'll instantly recognise the cow) and offers great views of the castle. Whether you're a tourist or a local we never get tired of looking out onto our beautiful city. To check out the Huxley's Brunch and Daytime menu, head over to their website. Plus if you sign up to their mailing list you get 20% off! Disclaimer: I was kindly invited to review the Huxley but this post, as with all my posts, reflects my own views and opinion.